design This is the 2nd ever 6-Bay NAS from the guys at Synology. After the Success of the DS3018xs Pentium based NAS for bigger business, this 6-Bay is designed with Home and SMB in mind. The chassis uses the familiar diskstation casing and click-n-lock trays. The design has always been popular with Mac users and it is pretty sensible that they would stick with this form. It is very compact, metal in construction and all trays can be locked as needed. There is excellent cooling on the rear, ventilation in the Synology logo on the sides and the rear panels and its ports are very discreet. 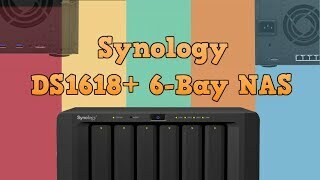 features In terms of physical features, the Synology DS1618+ NAS has a lot in common with the DS1817+ and DS1517+. The unit arrives with 4 LAN ports (so link aggregation is supported where needed to effectively quadruple your upload and download speeds to your device), multiple USB for external storage and two expansion ports to add two DX517 NAS expansion devices when needed. Next to these, there is a PCIe slot for adding 10Gbe connectivity, M.2 SSD cache with the m.2 M2D17 and NVMe based M2D18 card and more. At this price point of around £650+, it is a solid hardware purchase. performance Arriving with the excellent DSM software from Synology, the sheer number of applications available is incredible. Synology has their own Office application, Google Drive-like one stop app to open EVERYTHING in 'Drive', Synology moments and it's artificial intelligence means you have both facial and landscape recognition available. This is bolstered with a solid 1080p plex media server support, virtual machine management and a whole bunch of collaboration applications in Synology Chat, Synology Calendar, Synology photo and video station support. They are incredibly versatile and the entire user interface is genuinely impressive. Finally, there is the Synology Surveillance application that can support 40 cameras with relative ease. value For £650+ without VAT, this device is easily one of the best value 6 Bay NAS you can buy. Lower in price and comparable to the QNAP 6 Bay TVS-673e, TS-653A or TS-653B. You are getting very sophisticated software options and modern robust hardware. design There are several little design features that are missing from other NAS brands like QNAP (HDMI, Audio in/out, quick access and more). This is to be expected, but it is still a bit of a shame to not see a USB Copy Button or LCD for those that want more direct access. features The only real faults are more about the Synology NAS range as a whole than any individual unit. Synology has always wanted to keep the focus on network interactions only where possible and therefore connections that involve attaching smart peripherals or those that involve data being exchanged off-network, are largely absent. Additionally, use of an intel Atom-based CPU will no doubt cool a few users off. performance The Atom-based CPU is a little underwhelming when compared with the Celeron J3455 and Pentium seen in other units and this means, though it can support ALL the synology apps, it supports them to a slightly lesser extent than NAS like the DS918+ and DS916+ NAS. value Some user still has slight reservations with Intel Atom chips as they are a slightly older version of chip. It is still a fantastic CPU, but as it is not as new as the Celeron chips in the DS918+ and DS718+, and considered a little less efficient. If you buy this Synology DiskStation NAS and hard drives we do free build and test for the unit and hard drives. So you can use this device straight out of the box. All free of charge in DS1618+ price. Up-gradable up to 16 drives (even mixed size) and add 10GbE card or M.2 cache card.